My number one cooking rule is to always have a clean kitchen! In my opinion, cleanliness is the most important ingredient in any recipe I may be preparing. But there are so many cleaning products on the market these days and most of them are quite pricey. With our current national economic crisis, it is more important than ever to save in as many ways as possible. One area in which I have found a way to save a considerable amount of spending, is in the cleaning of my kitchen. You may ask, ” Is there an inexpensive product that will keep my kitchen clean and sanitized”? The answer to that question is a great big YES! All you need to keep your kitchen squeaky clean is vinegar and baking soda. 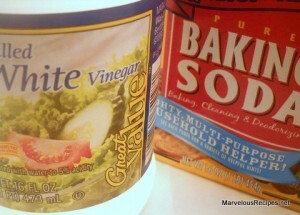 Yes, you read that right; plain old everyday inexpensive vinegar and baking soda. Read on and learn how to start saving money today with this recipe of simple ways to clean with vinegar and baking soda. Simply pour 1/2 of a box of baking soda down the drain; pour vinegar into the drain on top of the baking soda, creating a foaming action. Allow the foam to settle, pour some more vinegar in the drain and repeat this action until all of the baking soda is gone. Allow the drain to sit for about 1 hour after cleaning. Flush the drain with hot water before using, to help remove any dirt or debris left behind. Sprinkle a thick layer of baking soda over the bottom of a completely cooled oven; spray the baking soda with water using a spray bottle. This will help break down the food particles stuck to the oven surface. Every few hours, spray the baking soda with water to keep it moist. Continue this process over several hours, spraying water as the baking soda begins to dry. Scrape the baking soda out of the oven; food residue will be scraped out along with the baking soda. Rinse the oven thoroughly. The next time you use your oven, your food won’t have an oven cleaner taste added to it’s flavor! Fill a microwave-safe bowl with a mixture of 1/2 vinegar and 1/2 water. Run the microwave on high for 2 minutes. Dip a sponge in the vinegar solution and wipe the food off the walls of the microwave. No hard scrubbing is required; the food will literally fall off. How does this work? Heating the vinegar and water steams the food off and the acetic acid in the vinegar sanitizes and deodorizes your microwave. Make the switch from expensive dishwasher rinse agents (such as Jet Dry) to vinegar. Your dishes will be dry and spot free without using harsh chemicals. First, finish using any commercial rinse agent that remains in your dishwasher. Unscrew the cap from the rinse agent dispenser and fill the well with vinegar. Replace the cap and run the dishwasher as usual. Refill the dispenser as needed. To clean the inside of your dishwasher, fill the detergent dispenser with vinegar (no detergent) and run the dishwasher through a wash cycle. This will clean the wash tub, racks and even the heating elements. Pour white vinegar, full strength, into a small bowl. Soak sponges in vinegar overnight. Squeeze out and rinse thoroughly with cold water. Your sponges will be refreshed and ready for use. The acetic acid in the vinegar kills bacteria and eliminates odors. This will also extend the life of your sponges. Fill a spray bottle with full strength vinegar. Spray on all your stainless steel surfaces then wipe dry with a soft cleaning cloth. The acetic acid in vinegar cuts through the oil left behind by fingerprints, rather than smearing it around like most other cleaning agents do. Fill a spray bottle with equal parts white vinegar and water. Spray the solution onto the fruits or vegetables. Rub in or use a soft brush to work the solution into the skins. Rinse thoroughly with cold water. Fill a bowl with equal parts white vinegar and water. Soak the fruits or vegetables in the solution for 1 to 2 minutes. Remove from the solution and rinse thoroughly with cold water. The acetic acid in vinegar kills bacteria and helps dissolve the wax and pesticide residues found on the skins of many fruits and vegetables. Fill a spray bottle with full strength white vinegar. Spray on stove tops, range hoods, counter tops; basically any surface in your kitchen that collects grease. Wipe dry with a soft clean cloth. The acetic acid in the vinegar cuts right through the grease and leaves a streak free surface. However, DO NOT use vinegar on marble or other stone surfaces. The acidic nature will damage the surface and permanently etch and dissolve the marble surface. Always store the vinegar solution out of the reach of children. Label the contents of your spray bottles. Avoid all contact of vinegar with the eyes and prolonged contact with the skin.